"Small cars" refers to single truck cars numbered below 400. "Large cars" refers to double truck cars numbered 400 and above, including the Barney & Smith and Morris motor cars (500-518, 18 cars not 19), the Brill semi-convertibles (450-474), the Palace cars (600-723), the Southern Car Co. arch-roof cars (400-449), and probably the Perley Thomas and Brill arch-roof cars (800-899), a total of 317 cars. The 318th and 319th cars may have been the first of the Perley Thomas cars 900-972. There is a roster of streetcar assignments as of about 1945, thanks to an article in E R A HEADLIGHTS for July 1945, which reported data from railfan R. S. Korach. Reassignment of cars became necessary in the period 1946-1953. The lines out of Arabella Station were gradually converted to bus, beginning with Freret and Jackson in 1946 and 1947, followed by the Magazine line and Arabella Station itself in 1948. 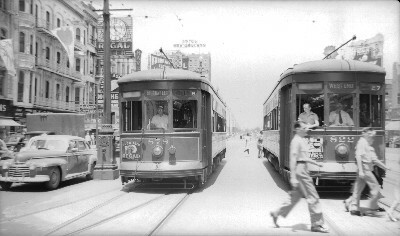 NOPSI then had more streetcars than it needed, and so scrapped the oldest, the 400s, in 1948. When St. Claude was bussed in 1949, the 1000s were also scrapped. We are fortunate that one photographer, recently identifed as Fred Victor DuBrutz, took a large number of photos of the streetcars on June 10, 1947, and that those photos have become available to railfans in recent years. At this date, Arabella was still open, and all of the cars that were operating in 1945 were still in service. Taking inventory of the car numbers and the routes they were serving on that date, we can extrapolate the following 1947 roster. The only assumption is that NOPSI continued the practice of assigning cars in blocks of consecutive numbers. It is likely that changes from the 1945 roster were minimal. Thus, 817-818 were probably still at Carrollton, with 819, 880, and 881 still at Canal Station, while cars 965-969 and 972 were probably still at Arabella. The most significant change from 1945 is the group of cars 884-907 or -908, which had been moved from Arabella to Canal Station. This makes sense, as the Arabella Station lines Freret and Jackson were gone. The photos show a few anomalous car assignments, all to the St. Charles Belt. Cars 857, 863, and 878 would be expected to be Canal Station cars, but are seen serving the St. Charles Belt line. This suggests that some runs on the Belt lines were operated out of Canal Station rather than Carrollton. 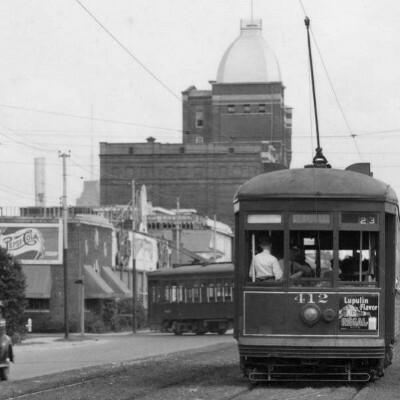 There was a non-revenue track connection between Canal Street and Tulane Ave. along S. Dorgenois Street, just inward of Broad Street, which dated from the depression-era temporary closing of Carrollton Station, and which was still available for use. A photo is known dated April 7, 1948 of an 800-class car (number unknown) turning from S. Dorgenois onto the outbound Tulane Belt track. It appears that some Belt line runs, perhaps some trippers, were operated out of Canal Station rather than Carrollton. Carrollton Station Shop was probably a very busy and crowded place at this time, and there may not have been enough room at Carrollton to house all the streetcars required to operate the Belt lines. By 1949, Arabella Station had been closed to streetcars, and the Magazine, Desire, Gentilly, and St. Claude lines had been converted to bus. Also, the 400-449 and 1000-1019 series had been scrapped, and a few 800s were also gone. The only line closed in 1950 was West End, at the beginning of the year. Based on fewer available photographs dated from 1949 and 1950, it appears that most of the surviving 800s were assigned to Carrollton Station (i.e., to the St. Charles & Tulane belt lines), with some high-numbered 800s and all or most of the 900s at Canal Station (serving the Cemeteries and West End lines). In 1948/49, the S. Claiborne and Napoleon lines, which survived into early 1953, were being served by high-numbered 900s (959, 966, 969, and 971 are known at that time), but it is unclear from which station they were operated. It is known that at different times in their last few years, these two lines ran from Carrollton Station and from Napoleon Yard. (There is a photo in Hennick & Charlton's book, p. 211, of S. Claiborne car 818 at Carrollton Station, dated September 4, 1951.) It is possible that they could have operated for a time from Canal Station, but that would have involved long pull-out and pull-in runs, so it seems unlikely. A photo is known of car 877 on S. Claiborne, dated by internal evidence to late 1952, and one is known of 844 signed Napoleon with date January 29, 1953 — very late in the life of both of those lines. Car 844 was scrapped in April 1953, but 877 survived until February 1955. One possibility is that in 1949, the two lines were being served by high-numbered 900s assigned specifically for the purpose to either Carrollton Station or Napoleon Yard, perhaps supplemented by 800s from Carrollton. It seems likely that at the end, the two lines were being operated from Napoleon Yard by 800s, some of which were scrapped with the line. 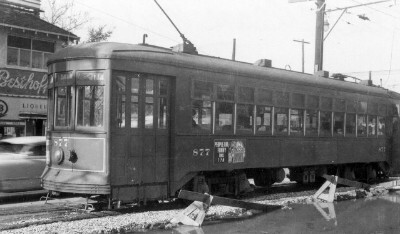 Car 877 at the S. Claiborne line terminal at Carrollton Ave. The activity visible in the foreground appears to be the construction of the terminal for the bus line which replaced the streetcar line in early 1953. When it was decided to abandon the Canal line and remove the rails from Canal Station, the car assignments were revised, with the best cars (many of which had been at Canal Station) sent to Carrollton Station, and the rest, including all the surviving 800s, sent to Canal, to be scrapped with the line. Aside from a few cars from Canal that were transferred to museums and other private operations, all the cars that ended service from Canal Station were therefore scrapped in 1964. The cars remaining at Carrollton Station, however, were extensively rebuilt, and continue in service today after yet another rebuilding. Copyright © 2014, 2015, 2016 H. George Friedman, Jr. All rights reserved. Permission is hereby given for the QUOTATION of SHORT excerpts, as long as credit is given to H. George Friedman, Jr.